When I take my Evening Primrose Oil supplements daily, I do not suffer from menstrual pains or period pains. But when I get lazy or forgetful (as I have been lately) the pain can be debilitating. Fortunately for me, it just lasts a day but it is a whole day of torture. I’m sure many of you can commiserate. I am quite anti-drugs so I don’t take any painkillers – I don’t even take Panadol for a headache if I can help it. Usually, I down a few caplets of Evening Primrose Oil and the cramps go away for a while. Enough for me to function anyway. It does however leave me feeling a little sleepy and bloated and generally uncomfortable. But no pain. Recently however, I was caught in a bit of an unfortunate situation. I was out of town and had to attend meetings and be functioning at prime alert, but I was hit by period pains! So in a fit of emergency, I ran for the nearest pharmacy and picked up a strip of Panadol Menstrual pills. I’d never taken it before but I’d been told that it helps relief period pains, so I popped 2 pills and hoped for the best. I wasn’t expecting anything, but must say I was a little surprised. It did work. In a few minutes, the pain had all but subsided and I was a fully functioning human again! I didn’t feel too bloated nor uncomfortable. Being a pain killer, it kept me pain free for a few hours – enough to get through the day. Later in the night, I did start feeling the pain again but by then I was off to bed so it wasn’t as bad. 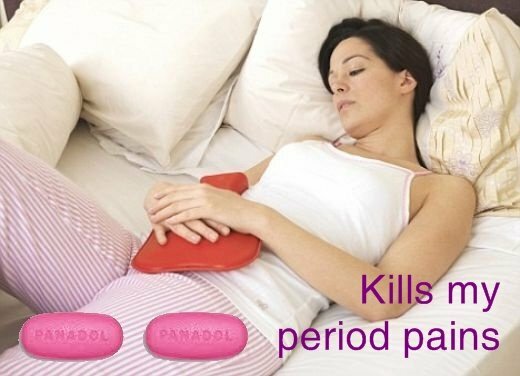 Have you taken Panadol Menstrual pills before and does it help you? I think this worked for me as I don’t take painkillers regularly, and my period cramps don’t leave me bedridden – just uncomfortable. For those who do have more severe pains, this might not work as well. A strip of 10 Panadol Menstrual pills retail for about RM3+ at pharmacies. This is based on my experience and yours may vary. If in doubt please consult a doctor. PREVIOUS POST: The Pink Cow Strawberry Sundae Bath and Shower Gel : Gotta love the name! Period pains are the worst part of being a female. Unlike you, I can’t function at all without my painkillers because the pain can get so bad and my family has a history of fainting during that time of the month. I haven’t taken Panadol Menstrual before since I’ve been on Synflex since teenaged years. Seriously, I can’t imagine how I will go through labor pains in the future! aih. the perils of being a female. Well an over the counter medicine won’t be as strong as a prescription one 🙂 Still it worked for me in under half an hour so I’m thinking its just that my cramps/pains aren’t that bad and my body isn’t “immune” to painkillers 🙂 I also do tend to have the whole sore lower back, and heavy bloated feel. Bah! Its just normal panadol with some antidiuretic…. it works because it numbs the pains and reduce water retention. I sometimes confuse period pain as stomach ache until I remember what time of the months it is. Not sure whats in there but whatever it is works! I could never confuse my period pains with stomach ache because when I do get a stomach ache, that’s absolutely numbing! I used to take Panadol or Ponstan for my cramps. I only take them now only if the cramps is too much to bear. I’ve the pain on the first day of my period, if the first day is a weekday, I’ll work from home. I always hope it will be on weekend so that I can hide under my duvet and sleep the entire day. I try not to take painkillers. Call me a glutton for punishment 😀 But I was told by a doctor that ponstan (and not regular panadol or paracetamol) is advisable for period pains because of what it contains and which pain it dulls. I’m not sure about that, but I know that when people I know see a doctor for period pains they tend to be given ponstan. I used to take some painkiller for periods but found that whenever I took those meds, my period seem to last longer. I’ve stopped taking them since. I also find that during those months that I’ve been active in sports, I don’t get as much period pain. But for those times that I do feel awfully bloated and the pain’s too annoying to ignore, I’d fill up a bottle with very warm water, and just warm my tummy where it hurts…and it does relieve the pain a lil. Yes I even did that in office ;P . When I’m at home and if the pain’s still there (it usually only lasts a day, the pain that is), I’d sleep it off. Exercise can help reduce cramps actually which might be why you don’t feel the cramps as badly when you have been active. So the key is to remain active constantly 🙂 most of us lead too sedentary a lifestyle which might be why we are facing all these problems. I have learnt some yoga poses that do help with pains though and if I do practice my yoga more regularly I get less pain 🙂 Using a hot water bottle is a great idea and definitely helps! Panadol Menstrual does not work on me. When I have cramps, they’re incredibly debilitating ones so I get prescriptive painkillers that are way stronger than the OTC ones. Sadly no OTC ones work on my kind of pain. I can definitely sympathize with women who have terrible period pains. I might give it a shot 🙂 Been told its good. I am a medical person so i do believe in drugs and regularly took it as necessary. At least we already know the indication and the possible complication.. and as a reminder supplement/herbal medicine do contain chemical substance/drugs too as many people might not be aware of. I think I’m immune to almost every OTC pills out there. My pain usually last 3 days; I’ve cut down on coffee after my doc. Told me to, I’m healthy, keeping a good weight of 125. She Prescribe me 2 different pills before but I can’t rember their names, but ryde celebrex which I’m using now, not even that works. It would stop for 45minutes then starts back and what u hate the most is that it always starts at night. My doc. found nothing wrong with me. Not even herbal tea works…I’m becoming a bit paranoid that all the meds will affect my productive system…. Where can you get these evening primrose oil pills? Hi ladies,Pls do try something called organic blackstrap molasses.Its this blackish brown liquid which is the end product of distilled sugarcane which is high in minerals.It does not taste good on its own but you can try it out mixed with any hot drink of your choice.Works wonders for period pain and is all natural.Please do google and check it out.